Catherine Pooler is having a House Warming Party to celebrate her new website and there's a project challenge with the theme of HOME. My card uses a lot of watercolouring. 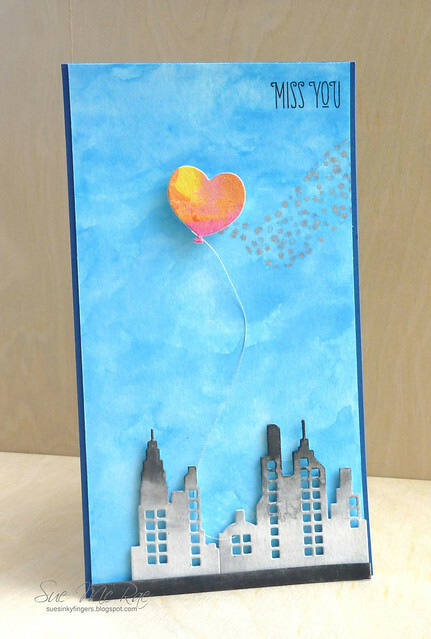 The buildings, the heart balloon (both with dies from Paper Smooches) and the sky were all done with watercolour paints. A great card for a dear friend who lives so very far away. There's still time to play along with the challenge and there's prizes to win by some fabulous sponsors. Go check it out here. I cannot tell you how much I love your card! The watercoloring on the buildings makes them look like they are covered in the soot and grime of the city and the trail of pixie dust following your heart balloon makes me happy! OMG!What an absolutely awesome card Sue!!!! Love the little thread threading through the building...and the dual coloured building itself!! awesome! Love your tall card, Sue! The colors and inking are gorgeous! I adore the wave of silver pixie dots, too! Beautiful and fun card, Sue! Love the way you've coloured the building and the heart shaped balloon looks so pretty flying in the gorgeous sky! I'm sure your friend will love it! I love the whimsical feel of your card! That balloon is so sweet! Eeeek! This is just OMG, I love it! Your water coloring is spectacular and I love that pink heart against the bright blue sky! !